Quite simply, the hunt for specific answers to important questions begins - and ends - with this clear, comprehensive resource. 401(k) Answer Book covers all aspects of plan design and administration, as well as the relationships of 401(k) plans with other types of retirement plans. When participants, sponsors, or service providers ask you questions, this book gives you the answers. 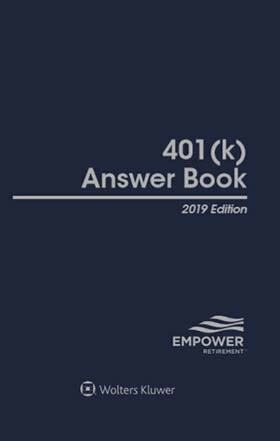 401(k) Answer Book provides coverage of 401(k) plan design, testing, taxation, reporting and disclosure, and termination, and brings you up to date on investment-related topics and regulatory guidance. Written by the experts at Empower Retirement, this comprehensive one-volume desk reference is a must have for pension administrators, benefits managers, fund managers, trustees, accountants, attorneys, human resource professionals, consultants, advisors, and anyone who deals professionally with 401(k) plans.